Session: 8:30 a.m. – 5:00 p.m. Lunch will be provided, along with copious amounts of caffeine throughout the day. You will be on your own for breakfast and dinner. This one-day seminar is designed to show you how to quickly and easily implement a marketing plan for your IT services business, including how to automate your marketing, build a prospect list, secure more appointments with highly qualified prospects, fuel referrals and repeat business, close more sales and expand your relationship with existing clients. The top 5 campaigns that are working RIGHT NOW across the country to sell more outsourced IT support. We'll give you all the templates you need to duplicate these strategies in your business that will allow you to sell more services to existing clients and erase price resistance, sales stalls and the need to "convince" prospects to buy. We've put together a Cybersecurity Marketing Kit specifically for Meet Up attendees, designed to help you capitalize on the RED-HOT security trend. 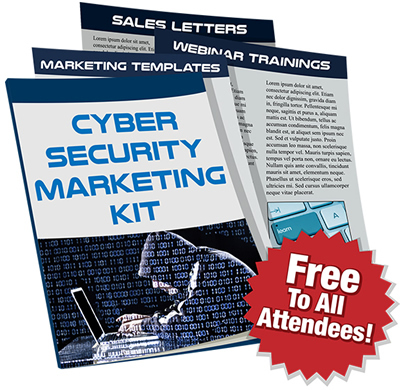 This kit takes all the guesswork out of marketing yourself as a security expert. We'll give you every e-mail, direct mail letter and the training materials you need to start attracting a flood of "sweet spot" clients and position you as an expert in security. This is a BRAND-NEW system that is NOT in any of the products Robin has created to date. We'll be doing a session exclusively on HOW to implement the pieces of the kit as well. If you want to know EXACTLY WHAT TO DO to pull off a successful cybersecurity campaign, this one session will be invaluable to you. How to set up automatic "Marketing Oil Wells" in your business that will deliver a steady, predictable flow of high-quality prospects to your door on an ongoing basis. This process is extremely important if you want to simplify and reduce the workload of marketing, selling and getting more new clients. We'll show you "the missing link" in your marketing that will easily double or triple your marketing results. We'll show you a brand-new trend in the marketplace that is catapulting marketing results. We'll hand you a step-by-step blueprint – including all the scripts, tools, secrets and metrics you need – to add this missing piece to your marketing arsenal. The ridiculously easy, often-overlooked campaign one client used that generated over a quarter of a MILLION dollars in new sales to existing clients without ANY direct mail or begging; this single campaign is CHEAPER than anything else in the marketplace and will prove to be your simplest and quickest revenue add all year. Members have duplicated this campaign time and time again, increasing their revenue by up to 50%. How to get out of overwhelm and finally START marketing. How to build a list of prospects with the LEAST amount of effort and work. How to create an e-mail list to get a flood of responses whenever you want, on demand. If your list is "dead" and unresponsive, or if you simply don't have a lot of quality e-mail addresses, this session will show you what to do to build a high-quality, hyper-responsive list. The "fool-proof" marketing campaign checklist that will instantly reveal whether or not your marketing campaign will generate a response – be it a website, postcard, telemarketing script, e-mail or flyer. How to organize your list of prospects so you can quickly and easily reach them. How to select and set up the correct CRM so it doesn't create a MAJOR problem for you.